Hey guys. Not to be a complete D, but does everyone realize that they have 2 versions of this revolver HDR50 and TR50. The HDR shoots higher FPS/joules then the TR model. I have the TR50 that has the F stamp. The first shot on new 12 gram 327fps. The next 11in the 312 to 320 range. After that 250-275 fps for 15 rounds. The gun has great efficiency, the TR50 came with a total of 5 cylinders. I like this gun. I also own many 3357s and the Khaos conversion model. This may be a little easier to use in a game then those. I think the HDR model would be the best starting point for a 68 cal model, but it would require new printed cylinders, and extensive reworking of the existing frame. Maybe, the best answer is to transplant the power train into a new printed frame and cylinder system. Most paintball (and airsoft) store have the TR50. Some stores have the HDR50 but describe 7.5 Joules. Ouch, I would hope so, but reach out to MCS and see. They've been very responsive to my emails. For those wondering, a Sellswords Khaos is approximately 765 grams. 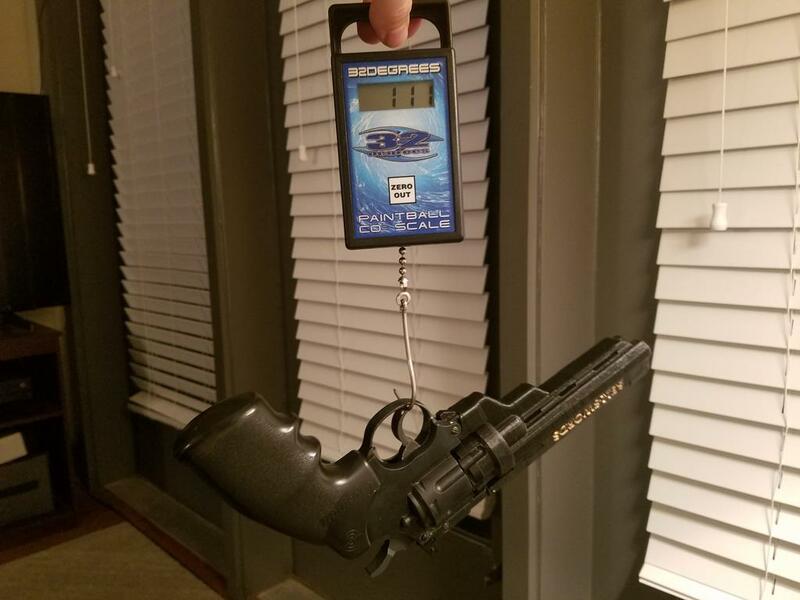 Edit: had to re-weigh the gun because I originally forgot there was an empty 12gram in the grip. Last edited by The Inflicted; 03-27-2019 at 12:32 PM.